Often, living in a city your entire life, means that you become a creature of habit – travelling the same routes to work and school, eating in the same restaurants that are comfortably child-friendly and seeing the same family and friends for a braai on Sundays. To break out of this routine requires energy and effort that a hectic lifestyle seldom allows for. We understand that all too well. 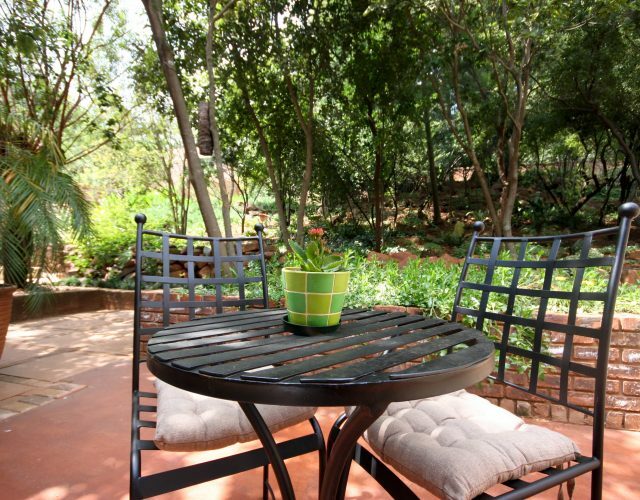 Bellstone B&B is situated in the heart of Faerie Glen – an upmarket suburb in the east of Pretoria. Apart from the beautiful green settings, Bellstone B&B is within easy reach of a rich selection of culinary and cultural treats. And although some of these may already be familiar sights, becoming a tourist in your town is a whole different kettle of sushi. Fancy a real Thai massage? Thai food to go with the whole experience? Or have you always wanted to explore Japanese tempura? Perhaps you need to sink your teeth into an iconic South African “smiley”, have some peach brandy and take in some Herman Charles Bosman on stage? For the musically inclined, Pretoria offers some surprising gigs. Who would have thought that the Voortrekker Monument would become renowned as a prime venue for South African musos? Ever considered listening to some jazz in a township? How about exploring interesting shops with stock from the 1st and 2nd World Wars? Or Makulu Hopaan – reminiscent of the overflowing farm shops of our childhood? Have you ever been to our famous markets – for farm products, culinary delights or handcrafted treasures? Ever eaten Moroccan food on a roof terrace overlooking the whole of Pretoria East? Would you like a special picnic to pop The Question? Or go for a sunrise trip on a hot air balloon? Whether you are planning a special occasion or just a different kind of date night, we will gladly assist in making your dream a reality. At Bellstone B&B, we go the extra mile for you – no matter if you live just around the corner, or come all the way from Europe. We believe in service beyond our four-star grading. Contact us today to discuss your creative idea for a special travel treat.